The Youngest, All-Around World Gymnastics Champion as noted in the Guinness Book of World Records. 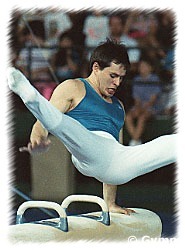 Dmitri has been inducted into the International Gymnastics Hall of Fame on May 9, 2003. This event took place in Las Vegas and Oklahoma City with many of his family, friends and fans in attendance! Dmitri Bilozertchev was born in Moscow, Russia on December 22, 1965. He become the World Champion after only 10 years in the sport, winning the AA title at the 1983 World Championships. 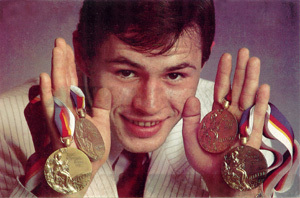 While under the guidance of his coach, the great Alexander Alexandrov, Dmitri earned many prestigious titles, but never the Olympic AA title for which he strived. The AA favorite leading up to the 1984 Olympics, the Soviet boycott kept him from trying for the title. Instead, Bilozertchev would compete in Olomouc at the Alternate Games. He won these games easily, bringing home five gold medals (including the coveted AA title) and one bronze medal. With a win at the 1985 Europeans, he looked to be the favorite for the 1985 World Championships. However, on October 13, just 10 days after receiving his driver's license, Dmitri was in a serious car accident in which he broke his leg in over 40 places. He narrowly escaped having his leg amputated, instead undergoing three operations. Following the accident, Bilozertchev taught himself how to walk again and began training just one year after the crash. By 1987, he was back on top and won his second World Championships title-even while parts of his leg were numb. Dmitri came to the USA in the early 90's for a competition. 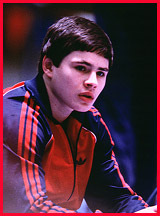 In 1993, Dmitri showed up at the World Championships in Birmingham, England as Valeri Belenki's coach. (In 1993, Belenki's native country of Azerbaijan was not recognized by the F.I.G., but because of Belenki's accomplishments under the Soviet Union, the F.I.G. made a special allowance for Belenki to compete for himself and not a country). Dmitri has since competed in the the 1994 and 1995 Reese's professional competitions, along with some other exhibitions. He lives in Tigard, Oregon with his wife, Olga Dubrovskaya (a choreographer who, according to IG magazine, often works with Svetlana Boguinskaia). his son Alexy and Daughter Alisa. Dmitri & Olga currently own and operate United Sports Academy Gymnastics in Beaverton, Oregon.